Meet our Newest Student, Karan! Today, we were very surprised to see that our students brought a friend with them to our daily classes for illiterate children living in poverty: His name is Karan (depicted above), and he goes to an Indian government-run school in the neighborhood. Karan came knowing the alphabet and the Hindi "prathmik gyan" (how we say "alphabet" in Hindi), but he still struggles with both sets of characters. Though he can read each of the characters properly in either language, he has a difficult time remembering the correct order of the symbols and cannot recall the letters from memory. Karan's arrival marks a milestone for our NGO, as our classes have been offering the children a safe environment, where they are motivated to come, learn, and work hard to achieve their goals. We are very proud that our students are enlightening their friends to join our classes to enrich their lives with precious knowledge. On another note, our volunteer from the US, Justin ji, has been spending extensive time with each child, especially Arun, to ensure that they properly learn the material they have been taught in their school. 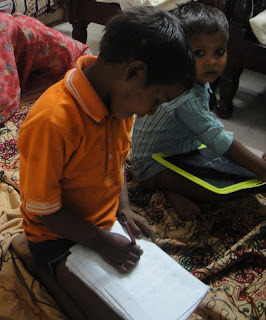 Arun, Priya, and Karan all attend government schools, but they lack discipline and sometimes learn material incorrectly when they practice and memorize their coursework at home. It was troublesome for Arun to forget his mistakes and relearn the English alphabet (as he had forgotten the letters "E" and "F," moving from "D" to "G," among other mishaps), but Justin ji's arduous rehearsals of the alphabet finally made an impression on Arun's mind, as he has relearned the alphabet correctly. We hope we can meet more volunteers who can help us with our mission to illuminate these children out of ignorance. Stay posted on our blog, as we have a variety of new ideas to share in the coming posts! I am writing today because I witnessed a very inspiring sight yesterday when I was invited for lunch at a neighbor's home. The neighbor has adult children, and runs a home filled with his children and grandchildren, with the help of one maid. Though the work appeared to be very demanding, once everyone was out of the house, and I was there sipping some chai, I overheard, from across the room, somebody was reciting the English alphabet, in a very heavy accent. When I looked over, I noticed the maid herself was reading from a notebook aloud! It was quite surprising to see that this young maid, who doesn't attend any school, took the initiative to start to learn English on her own, as she practiced reading the alphabet correctly from memory. Even more surprising to me was that the family that invited me for lunch doesn't speak any English really at all: They simply enjoy my company! The maid had no access to any English newspaper, as the family only receives a copy of the news in Hindi each day, and yet the family still took the time to offer their maid English lessons. I am still surprised with what I witnessed, but it is very heartening to see that many average, middle-class people in India do want to help out their illiterate brothers and sisters in India. We should not take our own education for granted, as I never realized how precious being able to read a sign or write a message really is until I started working with Ek Koshish. As we have been keeping up with our classes, I am posting a picture from our last lesson with the children, when we practiced dictation with the advanced class, and continued with basic numbers and letters with our beginners. Second Class with our New Students! Last night, we held the second class with our newest students at Ek Koshish. The children came eagerly to class, excited to learn new material, as they had been out of school all summer up until now. With Arun, we got to work on learning all of his capital letters in cursive, as he had advanced up to this level. He was having trouble with capital G, but we taught him the correct way. Interestingly enough, the cursive script we use in India is quite different from the cursive script we are taught in the US, especially when it comes to capital letters: so, I too learned how to write the cursive letters in English when in India! Arun has mastered the first half of the alphabet in cursive, and he knows all of the letters in printed form as well. 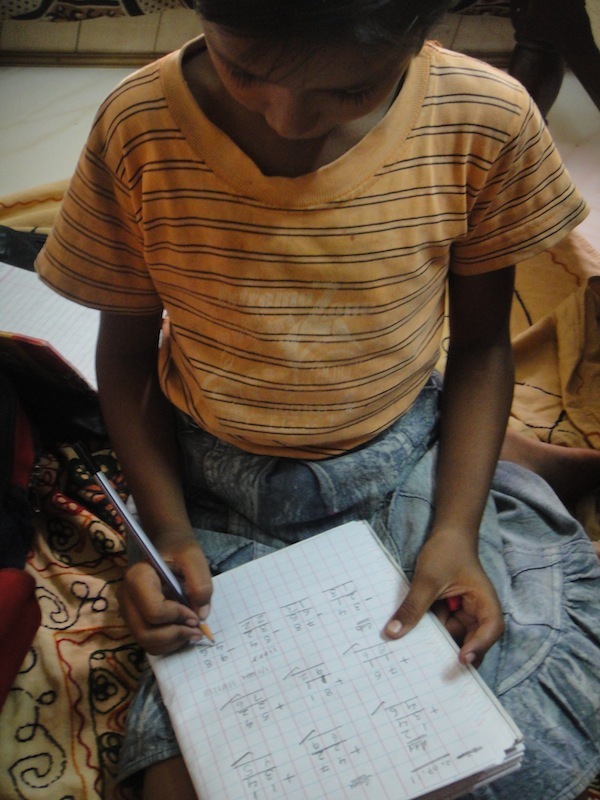 Poonam, the youngest of the children, is surprisingly advanced, compared to her older brother and sister, as she knows the whole alphabet, and knew how to add and subtract small numbers. Priya was very good in her addition and subtraction practice with us, so we gave her some more advanced practice with adding and subtracting: Soon we can teach her how to carry over numbers when adding. When I spent time with Nancy, she showed great progress with her counting numbers, on her own, up to twenty, and recognizing their corresponding symbols by heart. Badal, up until yesterday, could not draw any number besides "1," but yesterday the director from Ek Koshish sat with him and helped him to be able to write the number "2" on his own! He drew the number several times for practice, and we hope that he can move on to more numbers in the coming lessons. Finally, Vicky is still having a hard time recognizing that letters aren't numbers, but he has been practicing writing the capital letters "A" and "B" quite well, and can write the numbers "1-4" like a natural now. I am very proud of our bright young students, who are desperate to escape from the life of poverty they currently lead. New Students Join Ek Koshish! Yesterday, Ek Koshish hosted a new class of children who come from slum areas of Delhi NCR in Faridabad: Four children, Arun (about 7 years old), Priya (about 9 years old), Monika (about 5 years old), and Poonam (about 2-3 years old), attended their first class with us. In the picture, see Poonam, Priya, and Arun as they diligently took out their English notebooks and got to work at the beginning of class. Poonam is too young to join our classes, but the rest of the children have already learned quite a bit. They have been going to a government school in the neighborhood; however, they have not shown much progress with their work. 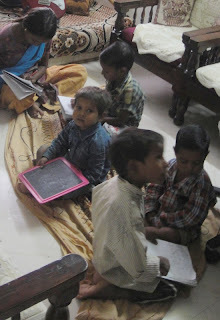 They have learned the English alphabet, counting up to one hundred in English, and some of the "Prathmik gyan" (the Hindi words meaning "alphabet"), but they have not accelerated beyond this point in their studies. They live not too far away from the Ek Koshish office, so we have welcomed them into our study group. Because it was our first day with the children, we learned about what the children have already learned, their weaknesses, and where they left off in their studies since summer vacation started. We look forward to working with our new students, who are more used to the routine of a structured classroom, and we hope that they too will help their fellow students, who are struggling, but determinedly proceeding, with the English alphabet! Last night, I just came back from a trip with my host family to Jaipur, known as the famous "Pink City" in Rajasthan, a popular tourist destination! The family had to go because of some work in Jaipur, so they invited me to come along with them. Upon arriving in Jaipur, we all stopped at Amber Fort, one of the major sites in the city. This site was the most interesting of any other we had seen, as we got a chance to see what the lives of kings and queens of India were like centuries ago. The fort was beautifully decorated, with plenty of interesting features to it: Several areas had been architecturally designed so as a windy breeze could reach an area where people would sit and relax; the water that would circulate the palace would collect so that it could be redistributed and sent to gardens over and over; there were passageways that were built so that a chair on wheels could climb a flight of stairs (see picture). Seeing that such an aged structure had even had areas that were wheelchair accessible was a stark contrast to the normal planning we see in urban areas, as they are usually highly restrictive for differently-abled individuals. After we climbed to the top, we were at an area reserved for the queen to observe the commoners below her: Though the area was inexplicably decorative, time and people have demolished the beauty in one portion of the area. Notice in the second picture, how the upper-left side of the photo was carved from marble, while the right side had graffiti and inappropriate scribbles on the wall. When I discussed this with the Ek Koshish team, we all agreed that it was a shame to see such a proud symbol of Indian culture ravaged by careless people. Ek Koshish truly hopes to preserve and spread awareness about Indian culture for everyone to appreciate, and they would like to convey the message to everyone to consider how to maintain our precious culture each and every day. Another eyesore for us to witness, and capture on film, was this picture of a little bird by, what appears to be, a birdbath, with trash around and even in the birdbath. We should all be very conscientious that each and every action we take could have an effect on the most helpless of animals, and we should respect our environment. Even when we were enjoying our trip to this new city in India, these images lingered in our minds, as we want to make an attempt to make a difference and reverse the negative trends we see every day. Otherwise, the rest of the trip was great, as we visited two famous Hindu temples, "Birla Mandir" (depicted below) and "Ganesh ji ka Mandir," (where "Birla Mandir" means "Birla [a name] temple" and "Ganesh ji ka mandir" means "Ganesh's temple" in Hindi), City Palace, Jantar Mantar (an ancient site where Hindus used manmade structures to calculate astrological and astronomical phenomena), and even the Crystal Palm movie theater, to watch "Transformers 3" in Hindi (an interesting experience, nonetheless)! It was overall a really great trip, and I look forward to the next trip I take here while I volunteer with Ek Koshish! In our last lesson with our students from Ek Koshish, we accomplished a lot with our students who were interested in learning. I spent a lot of time with Vicky, making sure he understood the differences between the numbers 1, 2, and 3, which he was able to write well. He was very confused that each different symbol had a different name, because at first he would say that each of the symbols were simply the number 1. By the end of the lesson though, he understood it, but he will need to practice it a lot, because he has to take a lot of time to process the information and remember which symbol stood for which number. I also spent a lot of time with him on the letter A (capital). He can also write this one well, having learned how to properly hold a pencil, but he still thinks that the letter is one of the numbers. We do explain it to him every time, and he starts to understand; however, after ten minutes without persistently asking him, he quickly forgets and thinks that it is also a number. He is very bright though, and he honestly does try his very best, it will just take some time for the information to sink in. Otherwise, he is very attentive, never gives up, and walks into class with the biggest smile of all of the children! Badal, on the other hand, does try a little, but I believe he is simply too young to pay too much attention to our classes, since he is about only three years old. He has learned how to count to seven in English now, and he has understood some common English parts of the body, so he is capable of learning, but we have to move at a slower pace with him. He is too young to properly use a pencil as well, so we will continue with chalk and oral exercises. Ajay though, is a very difficult child with whom to work: There is a word for his character in Hindi, which I have come to learn. He is not just stubborn, but "Akru" (the Hindi word for "obstinate"). He comes with the intent to have fun, and never try to work. Then, when we give the children treats, he is unwilling to work for his treat. At first, how could we deny giving this poor child from the slums a piece of candy or other special treat we bring for the children? I didn't have the heart to deny him. But, now we have refused to give him any treats until he is willing to work. His mother, a fellow classmate of his, is very disappointed in his work, and she even encourages us to use violence with him so he can learn, but we refuse to resort to any such methods for teaching the children. We want our classroom to be a safe place for the children, to where they always look forward to coming. If he continues with this staunch attitude, we will make him miss one of our classes as a punishment: When he sees his friends earn their treats and come back from their lessons happily, he will want to come and earn his treats too. Let's see if we have to enforce this new plan of action or not! Our other two students, Mohini and Nancy, have been learning at a very rapid pace! Mohini can recall "A for apple, B for boy, C for cat, D for dog" flawlessly, while recognizing the shapes of the symbols from memory. 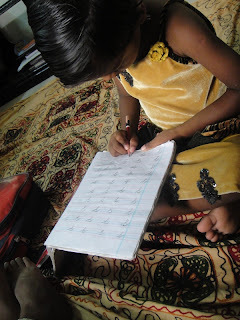 Mohini, having worked as a maid and washerwoman's wife for several years now, can count and recognize the symbols on paper, as she needs to know how to count to earn. Nancy, though, still hasn't mastered English counting one through ten, but she does recognize the shapes. When we mix up the numbers for her and ask her to recall any given symbol, she then is unable to do so, without us explaining to her to think of all of the symbols in order before reaching the answer to our question. Nancy has also been practicing several English nouns, after learning to read and write the first few letters in the alphabet. We are very proud of our students' progress, and we are looking forward to working with them again soon! Now, we are looking into arranging one more class, so that we can tutor two different sets of children at the same time. We don't want to handle more than two different batches of students at one time though, because we don't want to compromise the quality of education we offer the children with one on one tutoring for bigger classrooms. I am very lucky to have been helping out and working with the Ek Koshish team!